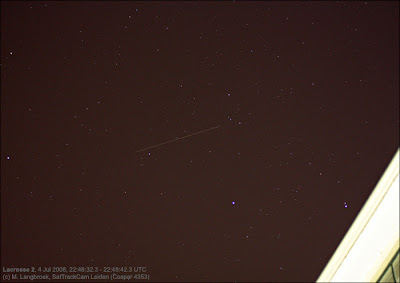 Last two weeks I took several images in order to calibrate the timing of the new Canon EOS 450D camera. I finished the calibration just in time to catch positions of the SAR satellite Lacrosse 2 (91-017A), which manoeuvred twice last week. As usual, this happened with perigee on the equator. The new Canon EF 50/2.5 Macro lens arrived as well. As promised by my friends who recommended it, it is a superb lens not only for macro photography, but also for astrophotography. Above are two examples of images I shot with the lens: one macro image of a seven-spotted ladybird (Coccinella septempunctata) on lavender in the Cospar 4353 garden; and an astrophotography result, obtained from Cospar 4353. 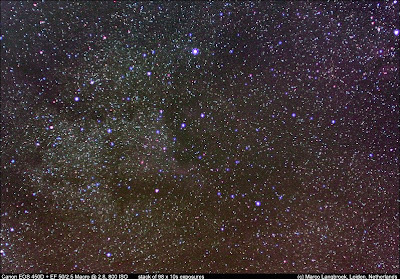 The latter shows the area around Deneb in Cygnus, including the North America nebula. It is the result of a 'stack' (digital sum) of 98 individual exposures of 10s each (mimmicing a 16m20s exposure). Combined with an ISO 800 setting on the camera, the EF 50/2.5 Macro goes much deeper than my previous Ixus camera's did, catching fainter objects. Last Tuesday and Wednesday nights, this was immediately apparent from the number of strays catched during satellite photography and a short astrophotography session. The lens (with 50 mm and a factor 1.6 equivalent to an 80 mm lens on an analogue camera) has about 25 degrees FOV, which is a 50% smaller FOV than I previously used, so pointing the camera correctly needs more attention. But the results are superb. 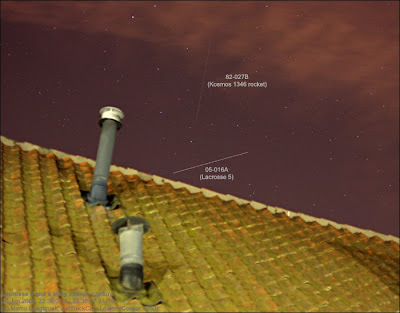 On the stars, I get astrometric standard deviations of only 5" (5 arc seconds) typically. The satellite positions have a larger uncertainty, as they are also influenced by the timing accuracy. The amount of noise produced by the EOS 450D sensor is much less than that by the Ixus camera's, and that pays off. While (unlike the Ixus) the camera does not standardly employ a noise reduction routine (which with the Ixus I suspected to sometimes "eat" part of the trails), the satellite trails stand out much better in the background, with less ambiguity as to where the trail ends. 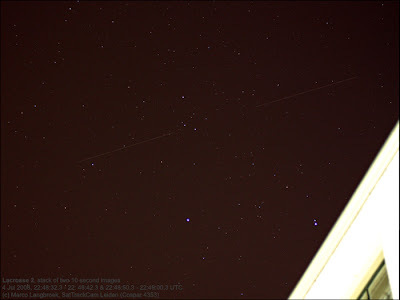 Below are two images of last night: a single shot of Lacrosse 2 (91-017A), and a stack of two images taken shortly after each other. Relative to the pre-manoeuvre orbital elset (epoch 08177.99486268) the sat was 35 seconds early last night, on June 30 it was 2 seconds. 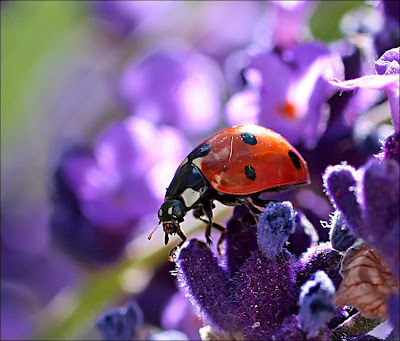 Beautiful photo of the ladybug.